A Lamborghini Aventador S press photo, not one of the ones in Manhattan for the conference. There’s a big cryptocurrency conference raking in about $3,000 a ticket in New York City this week (we’re totally going, obviously) and, as prices indicate, there’s a lot of show to go with it. Take the Lamborghinis parked outside of a hotel used by the conference, which Bloomberg reports were rented by a crypto exchange to add some false glamour. An upstart mining company also hired people to act as “aggrieved bankers who will lose their financial services jobs when blockchain takes over,” according to Bloomberg. This feels like the point when a magician would wiggle their fingers and talk about how “everything is not as it seems.” Because, really, it isn’t. Today [rental company founder John Nouri] stood outside the Hilton Midtown hotel in Manhattan, guarding three Lamborghinis — bright orange, navy blue and black — that Broadway SuperCars had rented to BitMex for the day. Nouri declined to disclose how much the crypto exchange had paid, but said a rental like that typically goes for around $1,000. The flashy cars that symbolize conspicuous consumption among Bitcoin true-believers had caused a stir earlier as they roared through the streets near the hotel. “I never made money with crypto but I have ten Lambos,” Nouri said. His company rents Lamborghinis out for $1,000 a day. 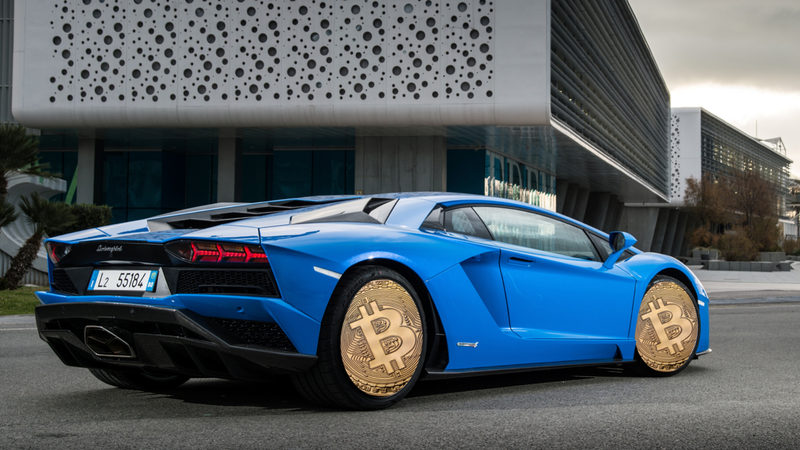 Lamborghinis have a deeper meaning to crypto enthusiasts than some random “bankers,” since buying a Lamborghini in particular became a sign of newly found bitcoin wealth on the internet. But the cryptocurrency high and all of the Lamborghini purchases that stemmed from it last year didn’t last forever. The price of Bitcoin slid well under $10,000 around the beginning of the year after peaking at more than $20,000 a couple of months before, and operations accused of being Ponzi schemes popped up to trick those caught up in the crypto hype into investing money they would likely never get back. Bloomberg reports that the tickets are between $1,500 and $3,000 each, easily putting admissions revenue at more than $12 million. That’s easily enough cash to rent a few supercars and convince everyone there that they, too, can be a millionaire overnight if they just take a little gamble on it. How Can You Have A New Lamborghini Here But Not Drive It In The Hollywood Hills?